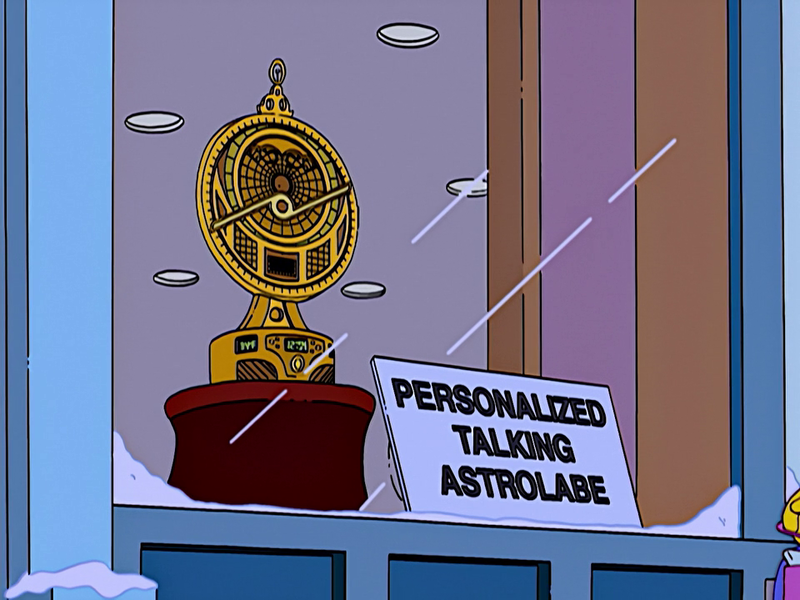 The Personalized Talking Astrolabe is a clock-like gadget that has a lot of features. Homer sees this in the shop Things Unnecessary and decides that he wants it. He buys it for himself for $500, the budget for the Christmas tree. After the family found out Homer was so selfish, it told him that it was not returnable. It then tests it's smoke alarm for three hours. After Homer steals all the presents from people, Snake steals the Astrolabe, still wrapped up, and runs off with it. Comes with a notepad and pen that work upside down. Predict the positions of the sun, moon and stars. Determine local time when given a local longitude and vice versa. Database of all countries' main exports. Three hour smoke alarm test. The voice of the Astrolabe is Hank Azaria. Modified on January 8, 2019, at 10:02.